Spartanburg County (pop. 284,307), west of Cherokee County, has the fourth-largest population in South Carolina. It’s the only Spartanburg County in the U.S. The county seat is Spartanburg (pop. 37,013). Spartanburg is the headquarters of the Denny’s Corporation, founded in 1953. The Spartanburg area was once known as “The Lowell of the South” because of its many cotton mills. Arcadia Mill No. 2 (1923) is now the Mayfair Lofts. 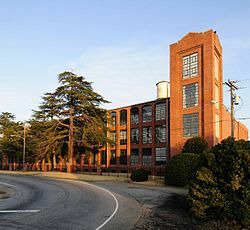 Mayfair Mills went bankrupt in 2001. The University of South Carolina Upstate, founded in 1967, has about 5,400 students. Wofford College (1854) is a liberal-arts college in Spartanburg. It has about 1,500 students. Amtrak’s “Crescent,” which runs from New York City to New Orleans, stops at Spartanburg in the middle of the night. 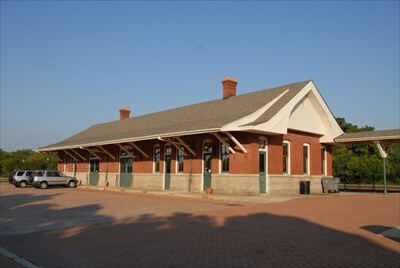 The station was built in 1904.